The Walking Dead is losing another one of its iconic characters. 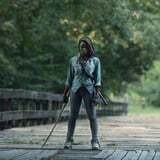 Sources have revealed to The Hollywood Reporter that Danai Gurira, who has played everyone's favorite katana-wielding badass, Michonne, since season three, has signed a deal to appear in the recently announced 10th season in a "limited capacity." Much like Lauren Graham's notable absence in season nine, Gurira's appearances are said to be interspersed throughout season 10, which will be her final season whether the show gets renewed again or not. Considering Michonne is still a central character in the show's current narrative, Gurira's departure will be a heavy blow to the series. The show has already seen the exit of two major characters, whose graphic novel counterparts are still alive: Andrew Lincoln, who played Sheriff Rick Grimes, left at the beginning of season nine, and Chandler Riggs's Carl Grimes departed in season eight. Though fans will have to say goodbye to Michonne as part of the TV series, the Black Panther actress may join Lincoln in any of the three Walking Dead movies that AMC is planning. After all, Michonne is a mother of two and a badass fighter. We can't imagine her having any kind of happy ending that doesn't involve reuniting Rick with their children.